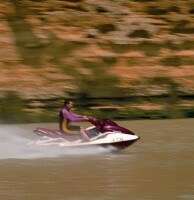 Murray River Holidays - Book your toys! If you or someone in your group has a ski boat, fishing boat or dinghy then it's definitely worth considering bringing it along with you on your houseboat holiday. Each boat is equipped with a side towing arm (V berth at rear of Unforgettable 11) which means you can simply hook your boat up to the side of the houseboat and this can be towed safely alongside the houseboat as you travel. If you don't have a boat then you may like to consider hiring one from us. We have ski boats and dinghies for hire at very reasonable prices. Under South Australian Law, a motor boat licence is required to drive these boats due to their potential speed so if you don't have one then contact us and we can send you the relevant information you need to study to sit the test. It's that easy! If you don't have a boat licence, you can follow the link below to enquire about obtaining one.